Based on the play "Cyrano de Bergerac", large nosed CD Bales falls for the beautiful Roxanne while she falls for his personality but another man's looks. When its comes to the Oscars, comedic actors don�t tend to get a lot of love, as Steve Martin can attest. Despite a few much-praised performances, Martin never got love from the Academy, and his lauded work in 1987�s Roxanne remains a blotch on award history. 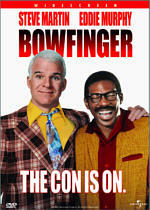 Nearly 30 years after the film�s release, it still looks like Martin got screwed. Was his performance the best of 1987? That I can't say, but Martin offered enough of a comic tour de force to at least warrant a nomination. A revamping of the Cyrano de Bergarac tale, CD Bales (Martin) works as the fire chief in a small Colorado town. He maintains a minor chip on his shoulder due to the gigantic nose on his face, an appendage so extreme that he could rent it out as a chin-up bar. Despite his facial deformity, though, CD usually presents as a likable, genial guy who stands as a pillar of the community. When lovely Roxanne (Daryl Hannah) comes to town, CD immediately finds himself smitten but his lack of romantic confidence - completely at odds with every other aspect of his personality - prevents him from the pursuit her affections. A complication arises when Chris (Rick Rossovich) arrives on the scene. Hunky Chris possesses every physical advantage in the book but he doesn�t present what you'd call a deep thinker. Even with his physical gifts, Chris also suffers from a lack of social confidence, so he entreats CD to use his intellect to win Roxanne to Chris' side. Given CD�s own feelings toward Roxanne, this creates complications. The movie�s story never rises above the simple moralizing of "it's what's on the inside that counts" but the performances help make Roxanne charming and entertaining. As alluded at the start of this review, Martin indeed excels as Bales. He brings a wonderfully fluid physicality to the role in addition to a verbal grace and wit that work well. When needed, Martin also makes Bales vulnerable and expresses his self-doubt convincingly. As Roxanne, Hannah seems acceptable, but I must admit her work never did much for me. For the audience to believe that Bales would feel smitten by Roxanne, we need to see more than Hannah's physical charms, and she partially succeeds in her attempt to convince us that Bales' attraction is more than skin deep. But only partially. Hannah�s Roxanne occasionally comes across as rather self-absorbed, especially since her relationship with Chris/CD seems to be completely about her. Granted, this occurs mainly for story reasons, but it would be nice to see what she gives back during the relationship, as we mainly see and hear her demands and desires. Rossovich aptly portrays Chris as an affable lunkhead. While our sympathies remain firmly in CD's court, Chris makes for a likable character. Of course, we hope that he'll fail in his quest for Roxanne's affections, but we wish him no ill will. Rossovich keeps the character genial but not overly compelling, which effectively maintains the distance from him that we need. The film boasts a strong supporting cast, but none of them really get much to do, as the movie focuses strongly on its three principals. Actually, Shelley Duvall seems vaguely irritating as Dixie, friend to both CD and Roxanne, but Fred Willard offers some well-practiced bluster as the town's mayor. Oh, and keep an eye out for Damon Wayans in a small part as another fireman. Director Fred Schepisi moves the story along at a decent pace, though some scenes seem to lag a little long and he tends to milk some gags too hard. 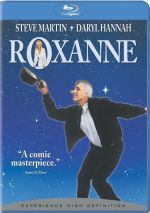 Overall, Roxanne becomes an affable little movie that probably would have been forgotten by now were it not for a fine lead performance from Steve Martin. Roxanne appears in an aspect ratio of approximately 2.40:1 on this Blu-ray Disc. While mostly appealing, the transfer had more downs than I�d like. Most of the concerns related to sharpness. Much of the film offered good delineation, but notable exceptions occurred, and those seemed oddly soft and mushy. Still, the majority of the flick appeared concise, and I saw no jaggies or moir� effects. Edge haloes were absent, and print flaws failed to interfere. In terms of colors, Roxanne went with a nice, semi-pastel palette that appealed to me. We got a rich mix of hues and the Blu-ray usually made them look good. Blacks were a little drab at times, but they usually seemed fairly dense. Shadows were similar, as low-light shots demonstrated good but not great clarity. Though a lot of the image worked, the softness and other minor issues made it a �B-�. Don�t expect much from the lackluster Dolby True HD 5.1 soundtrack, as is failed to deliver much dimensionality. The soundscape maintained a limited focus, as the side speakers mostly concentrated on music. This meant the score and songs boasted nice stereo spread. Effects came across with less impact. Vehicles occasionally moved from side to side, and I heard general ambience as well as chatter in crowd scenes. The rear speakers showed the lightest of environmental reinforcement, as the mix focused heavily on the front. Even a big fire sequence near the end failed to provide obvious use from the side/rear channels. Audio quality was mostly fine, though the track suffered from weak �secondary work�. Looping and foley sounded unusually fake. Take the scene where CD beat up the tennis jerks; the thugs made noises that didn�t vaguely match their mouths. Also, the sequence in which CD and Chris walked and talked showed iffy dubbing and effects. Still, lines were usually natural, and they always seemed intelligible. Effects also mostly seemed accurate and concise; they lacked a lot of range, but they seemed acceptable. Music came across as fairly full and smooth. The mix lost some points due to the iffy looping and borderline monaural soundfield, but it remained adequate for something from 1987. How did the Blu-ray compare to the original DVD? Audio showed minor improvements at best, but the image looked substantially cleaner and tighter. The Blu-ray was a notable step up in picture quality. The disc opens with an ad for The Pink Panther (2006). The disc adds a promo for Made of Honor. No other extras appear here. Charming and affable, Roxanne works largely due to a strong performance from its star. The rest of the movie fails to excel but it remains enjoyable enough. The Blu-ray brings us adequate to good picture and audio but lacks supplements. Roxanne gives us a likable comedy.